A brand that goes for sportiness, design or luxury is mainly working on an image. The customer feels attracted to the image that comes with the car and buys the product. With Kia it's more about functionality and quality. For Kia buyers, image is something that needlessly raises the price of the car. 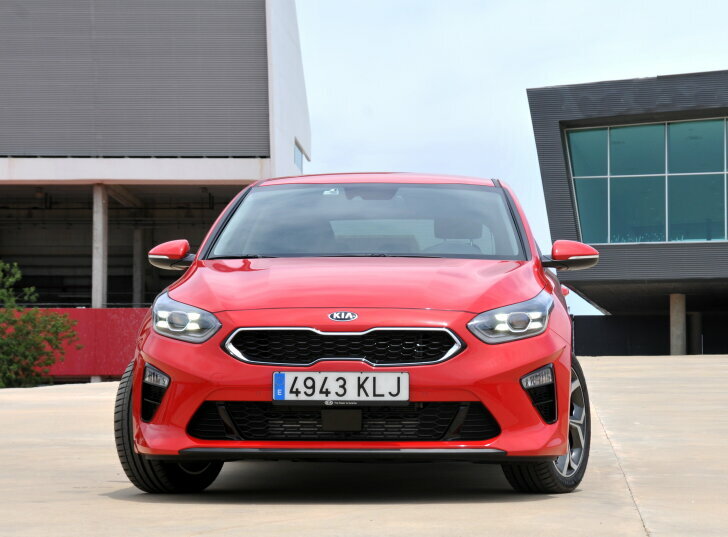 That's why the new Kia Ceed looks good, but it doesn't have a clear sporty, elegant or tough character. The exterior dimensions are almost equal to those of the previous Cee'd (then spelled with an apostrophe), because that turned out to be an ideal combination of cabin space and manoeuvrability. To improve visibility the A-pillars (the beams between the windscreen and the front doors) have been moved backwards by 68 mm. The boot lid is now wider, while the boot floor is lower to make loading and unloading luggage easier. The space in the front is good. To comfortably seat even the tallest and leggiest drivers, the side of the centre console has been indented. 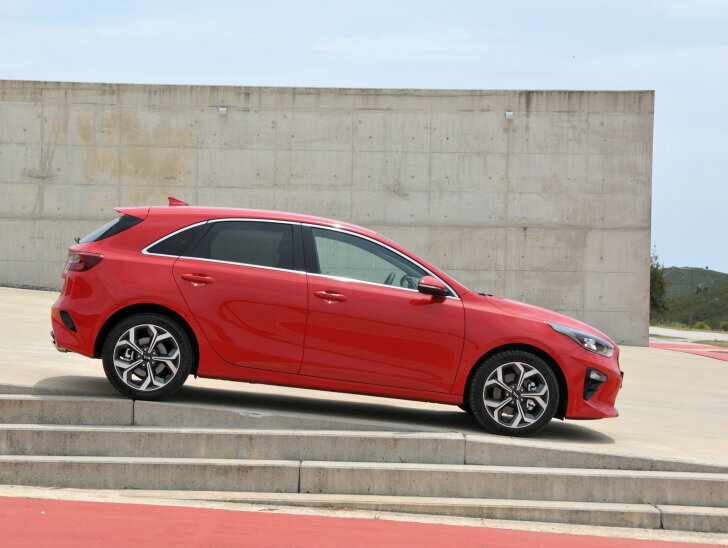 According to Kia, the Ceed offers the best legroom in the rear of any car in this segment, but the Autozine test driver's experience was different. With a tall driver in the front, little legroom remains in the rear for another tall adult. The design of the dashboard is logical, but not remarkable. Judging by the price, the Ceed is well specced and modern. The equipment is never innovative, but for a car in this price range the Ceed does offer the latest technology. For example, the Ceed can automatically maintain a safe distance from the car in front (adaptive cruise-control), brake for danger and make small steering adjustments to stay within the road markings. Also, the electronics will warn the driver about objects in the blind spot. The computer can operate the high beam of course without blinding oncoming traffic. All these functions are modern, but the competition almost always takes it one step further; at a price. The speedometer and rev counter are "old fashioned" analogue dials, with a small display between them that shows data from the trip computer. The central display on the dashboard is used to control the audio, communication and satnav functions. Thanks to support for Apple CarPlay and Android Auto all the functionality of the mobile phone becomes available in the car, now and in the future. The Ceed has just one single USB-connector, but partly makes up for this by offering support for wireless charging (Qi standard). Optionally, an audio system from specialist brand JBL is available. While the sound is decent, it doesn't compare to "high end" audio from other carmakers. Also on the option list are both heating and cooling functions for the seats. The first test drive was with the familiar "1.0 T-GDI" petrol engine, which can also be found in many other Kia models. With this 120 PS / 172 Nm strong three-cylinder the Ceed effortlessly comes along with the flow of traffic. The shift indicator suggests that at 2,000 rpm the next gear should be engaged and indeed, even at low revs the engine is still smooth. However, when requesting more this base engine lacks power and disappoints. Because only more power only comes available at very high revs, it simply takes too long for this engine to perform. Despite a very calm driving style on a simple route, the test drive took 6.4 litres per 100 km (36.7 mpg) and that's too much for a car like this. Brand new is the "1.4 T-GDI" four-cylinder petrol engine, which outputs 140 PS / 242 Nm. The difference with the 1.0 litre engine is obvious immediately. The 1.4 litre turbo engine performs with more ease and packs a bigger punch when necessary. The 1.4 T-GDI comes with either a manual gearbox or a seven-speed automatic. Because the gear ratios of the automatic gearbox match the characteristics of the engine even better, the automatic is preferred. Many car brands are phasing out diesel engines, but since Kia does whatever the customer wants, the new Kia Ceed comes with a diesel engine as well. Because Kia spends most research budgets on the development of new energy sources (electric / hydrogen), the diesel engine in the Ceed isn't new. Instead, it's merely an improved version of an existing engine. The improvements mainly have to do with the new emission standards ("Euro6d-TEMP"). The well-known engine now runs more smoothly and is in fact so quiet, that it can almost rival with a petrol engine. At the same time, the "1.6 CRDi" is very powerful at low revs, which makes it very smooth indeed. 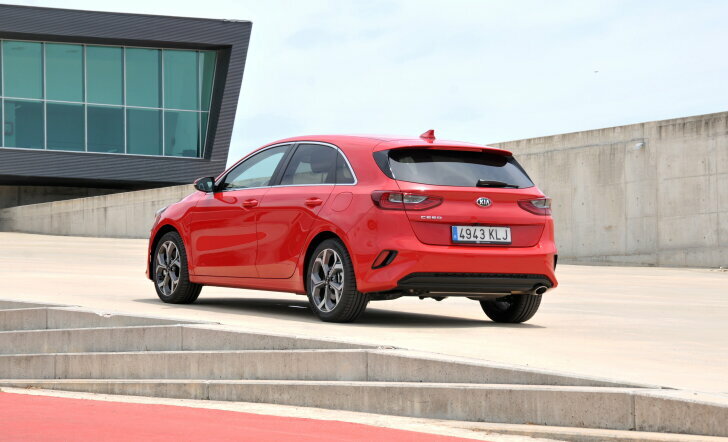 When it comes to technology and engines, the Kia Ceed offers everything one comes to expect from a modern car in this price range. Good suspension makes a car hardly more expensive, but does make driving it more pleasurable and safer. That's why Kia spent extra attention on handling. Again Kia doesn't give the Ceed a strong character, but instead tries to appeal to the widest possible audience. Kia only made one compromise. The Ceed runs on tyres that offer exceptional amounts of grip but this does mean that road noise is audible inside the car (extra insulation would make the car too heavy and/or too expensive). In all other ways Kia always found a good compromise: the Ceed has exact steering, but isn't nervous. Steering is light, yet not devoid of feeling. The underpinning is firm, yet comfortable. In this way, a car that's mainly a rational choice is still is joy to drive. Some call it boring, others call it a great car. Those who label the Kia Ceed a boring car, are car lovers that judge a vehicle by its image. However, with Kia it isn't about amusing people, but rather about functionality. Kia listens to the customer and builds his or her ideal vehicle. That's why the Kia Ceed offers the performance, technology and comfort one comes to expect of a car in this price range. At the same time the Ceed offers modern technology and competitive engines. The refined suspension means the Ceed has made a leap ahead in its segment. In short: what was good, is now even better.